Even though it seems we're never going to get a real frost in the tri-state area I've been cutting all my container gardens back. Last week I brought in cuttings from all my favorite coleus plants. I used some of them in this arrangement (along with a few begonia leaves, salmon ranunculus, red spray roses, eucalyptus pods, and lucedendron pods) some of them I'm rooting in the window to make new plants. I'll start them inside and then put them out again in the spring. I love coleus of all kinds and colors. And the giveaway! I don't have photos yet, but today we're playing with the most phenomenal ranunculus - pale yellows with purple tips. If you leave a comment, you'll enter to win an arrangement with these beauties delivered to home or work (Manhattan or Brooklyn) tomorrow, Friday the 19th. Good Luck! 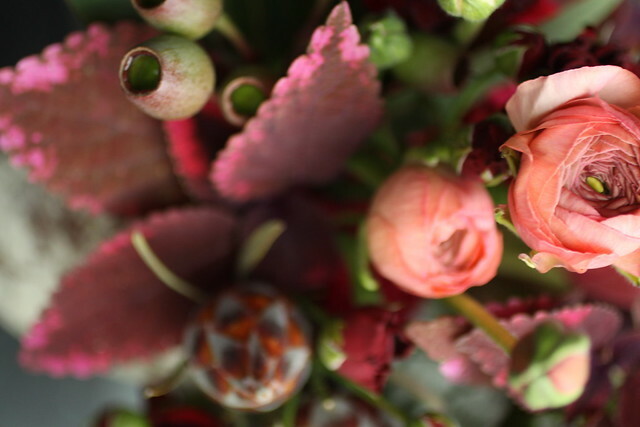 I adore those ranunculus and the seed pods. They were an inspired pairing. Yeah! Such a gorgeous flower - yeeehaw! Thrilled to enter for a chance to win! Virginia checking in for Brooklyn. LOVE! What a great way to cheer up the apartment for the weekend! 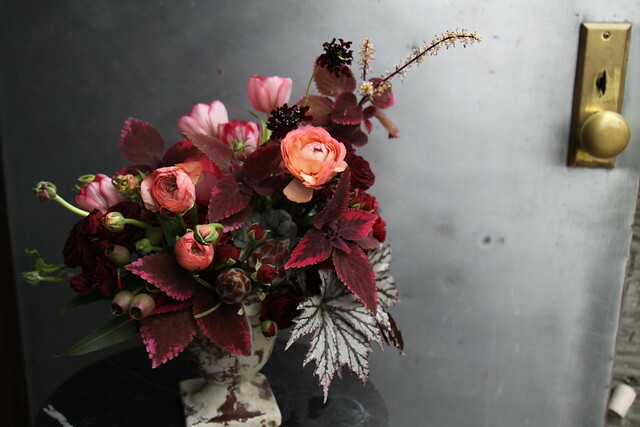 Gorgeous arrangement — can't wait for the ranunculus class in February! So pretty! Would totally brighten up my boss' week! ranunculus are my absolute favorites! SO pretty - crossing my fingers! The Columbia campus has some gorgeous coleus that I pass every day and I kind of wanted to steal some before it got wilty last week but didn't and now seeing this arrangement I deeply regret my decision. Not that I have all the pretty flowers (ranunculus! and those dark purple... scabiosa? I don't even know) you have to work with either... Ah well, one can dream! best giveaway of all time. hope i get lucky! ranunculas make me weak in the knees! Beauteous! Would go well with a fireplace and some smoldering glances. rununculus are the best! (just love sayin the word...) thanks for the chance to win such a beautiful arrangement! Tomorrow is my coworker's last day at work, so I want to win to give them to her! I love the foliage on this arrangement. Ranunculus are my favorite flowers. I would love to win this week. Gorgeous. My fingers are crossed. Ranunculus are the french kisses of flowers! Fingers crossed that a bunch will be mine tomorrow!!! oooh! oooh! pick me! it's so wonderful that you're doing this, sarah! I recently got married and used ranunculus for my bouquet. My florist used your blog as a huge inspiration for our flowers. It would make my husband and me so so happy to be reminded of our day in September again. 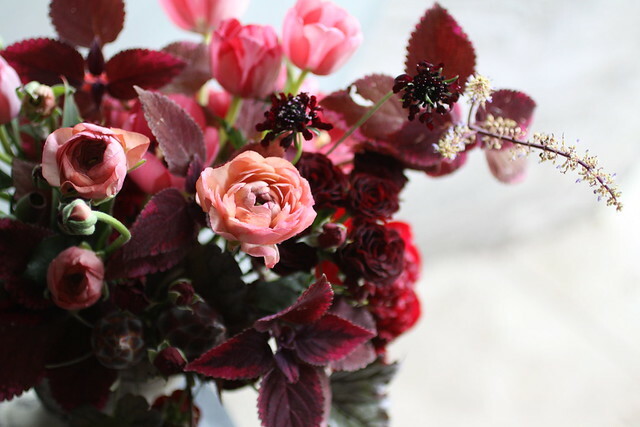 "Ranunculus, ranunculus, ranunculus," is difficult to say. ill name the baby ranunculus if i win. free magical garden walk if you pick me. especially rannunculus which was a favorite flower of ours back in the day. yellow and purple, and in brooklyn - yes please! count me in. I check in with your blog just to get cheered up -- as always beautiful! PS - my 4yr old son & his class have been asking about how to make soap -- would saipua be interested?? oooh, me please! Love your flowers. I could totally use these this week. your flowers are always gorgeous! Would love to send to my husband! Hope you are having a great week! Found your blog recently after purchasing coffee and mint soap at a boutique. The bf really likes it! I love looking at your flower arragnements. breathtaking as always! thanks for yet another chance! God it has been one of those weeks. Gahhhh.... So hoping that this is the week I win! I am in LOVE with all of your stunning creations. we're having a going away party for a dear friend tomorrow afternoon and there will be seven toddlers present. clearly we will be in need a sophisticated bouquet to set the mood. This would be the best "welcome to brooklyn" present and would be proudly displayed in my new apartment. i have a red-purple coleus that i've been sprouting off-shoots of. i now have one mama coleus, one teenage and 2 baby ones.